I’m often asked in the library to request The Secret by Rhonda Byrne. The book outlines the secrets of manifestation. In learning these ‘so-called’ secrets one learns how to get what one wants out of life. The documentary of the same name, which followed the book, features a number of individuals who have used these ‘secrets’ to create successful lives of affluence. Without a doubt these secrets—these specific guidelines—work. But one could argue that when we use these guidelines to get what we want out of life, the ego is at work. There is another way. It could be called the path of surrender. The result is also ‘success’. But the difference is that instead of getting what we want out of life, we allow ‘Life’ to get what she wants out of us. Invariably this will include a path of service. This is precisely what is described by Michael A. Singer in his new book, The Surrender Experiment. How do we know when an action is ego-driven? Such actions come from a place of wanting, of desire, and a subconscious belief that we are lacking something that is intrinsic to our happiness. Underlying ego-driven desires are deep-seated fears. We’ll know our actions are ego-centric when we treat the cleaner differently than we treat the CEO. We’ll know our actions are ego-centric when our perceived needs supersede those of others. We’ll know our actions are life-driven when we treat others as we would have others treat us. If this sounds like the ‘Golden Rule’ it is because that is precisely what it is. You’ve heard the expression: That which we resist persists. What Mickey Singer discovered and what he describes eloquently in The Surrender Experiment was: that which the voice inside his head resisted was precisely what life wanted him to do. And when he did that which life asked of him, magic happened. The cogs in the universal wheel lined up and took him in directions he could not have foreseen. Sound familiar? It has happened to all of us. When the will fails to get that which we seek, and we finally surrender, suddenly everything falls into place. We still have to work for it, but it’s as if an unseen force is assisting us and the work flows easily and naturally. Mickey Singer learned how to follow the invisible into the unknown. As he describes in The Surrender Experiment: ‘. . . I could see that the practice of surrender was actually done in two, very distinct steps: first, you let go of the personal reactions of like and dislike that form inside your mind and heart; and, second, with the resultant sense of clarity, you simply look to see what is being asked of you by the situation unfolding in front of you.’ In simpler terms, one could say that to surrender is to let go and let God. The Surrender Experiment is a truly inspiring read. Radio host, librarian, inspirational speaker and health educator John Haines is the author of In Search of Simplicity: A True Story that Changes Lives andBeyond the Search, books to lift the spirit and touch the heart. See http://www.JohnHainesBooks.wordpress.com In Search of Simplicity is now available as an eBook here. In the past I’ve written of A Child of Eternity, the incredible book about a girl locked in an autistic body and the profound messages she began to share once acquainted with a Japanese invention allowing her to type. A library patron who’d read that review suggested I might like another book involving an autistic child called The Horse Boy. There was something about the cover which didn’t appeal to me. But once past that, there was no stopping me from reading the book out loud from cover-to-cover to Lucia. What a story! Travel writer Rupert Isaacson and his child-psychologist wife Kristin give birth to their son Rowan seven years to the day from when they met under serendipitous circumstances in India. At the age of three Rowan is diagnosed with autism. Two years on he is still emotionally and physically incontinent and his parents are prepared to try almost anything to help him heal. The relationships of fully eighty percent of couples with autists implode. It can be an all-consuming responsibility. It certainly is for this couple. Rupert discovers the only way to get Rowan to settle from a tantrum is to take him out into nature. On one such jaunt through the woodlands surrounding their home in rural Texas, Rowan suddenly takes off, scoots under the neighbour’s fence and flops onto the ground in front of the cantankerous alpha mare of a small herd of horses. Rupert, an experienced horseman, then witnesses a first for him in equine dealings. The horse immediately drops her head and submits to this child flopping under her on the ground. 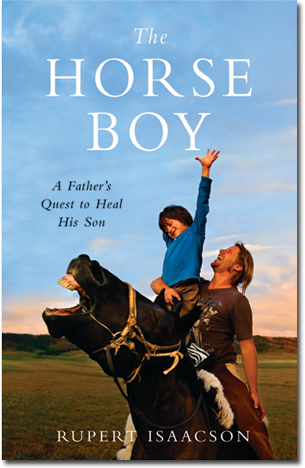 Horse Boy follows the incredible journey of a couple prepared to go to the ends of the earth to heal their child. It carries the reader into the hidden, untouched hinterlands ofMongolia and to the almost forgotten world of the shamans found there. Repressed through sixty years of communist rule, the few remaining wisdom keepers help the family in ways they could scarcely have predicted. Rupert Isaacson is occasionally poetic and often wise in his descriptions of the journey. Here is just one small excerpt partway through their Mongolian pilgrimage. Rowan is a boy with one foot in each world. His parent’s job, with the help of old-time healers, is to bring him enough into the physical world that he can function, without losing his innate spiritual connection. It works. But I will say no more. You’ll have to read this highly recommended book to find out more. I’m one brought easily to tears when reading a good story or watching a touching movie. Last week I read Khaled Hosseini’s The Kite Runner out loud to my wife, Lucia. I must have cried on at least twenty separate occasions during the course of the book, setting a personal tear drop record. Lucia burst into tears many times as well. The Kite Runner reads like a historical novel aka James Mitchener or Leon Uris, despite the fact the events described only go back to the late 1960s. Although the story is vastly different from Colleen McCullough’s Australian-set saga, The Thornbirds, The Kite Runner has a similar ability to reach deeply into the heart and soul of the reader. Set in Afghanistan, Pakistan and California, The Kite Runner follows the lives of two boys, best friends, growing up in Kabul in the 60s and 70s, The depth of tragedy they encounter and the love and dedication required by the narrator, Amir, to right the wrongs and lies of their past makes for gripping, hugely moving and inspiring narrative. Hosseini’s immense skill as a writer – his grasp of metaphor and his ability to tie seemingly disparate events into a cohesive whole – is truly masterful. This is a highly recommended read for anyone wishing to better understand the recent turmoil in Afghanistan and the beauty of Islam and Sufism. The Kite Runner is one of the best books I’ve read in a long time. I look forward to diving into more from Khaled Hosseini in the years to come. In Search of Simplicity is an autobiographical travel adventure story that reads like a novel. Over the years, when I’ve told some of the stories of coincidences now contained within the book, listeners began to have (or at least to notice) magical happenings in their own lives. Thank you for your time and support. May you and this world find peace. A few weeks ago a dear friend who’s a Baha’i lent me a book, Vignettes from the Life of ‘Abdu’l-Bahá, complied and edited by Annamarie Honnold. I’ve been steadily working my way through it. Rather one could say, it and the subject of the book have been working their way through me. Here’s a description found on the publisher’s website. Vignettes from the Life of ‘Abdul-Bahá is a unique collection of stories, sayings and comments, providing a special insight into the life, character and station of Bahá’u’lláh’s eldest son. He was universally known to Bahá’ís as the Master but wished only to be known as the Servant. Not only those qualities for which He was chosen as the Centre of Bahá’u’lláh’s Covenant, but also the human virtues which made Him the Perfect Exemplar for all Bahá’ís, are amply illustrated in over two hundred and fifty vignettes of His life, drawn from a very wide range of published, out-of-print and unpublished sources. The book is divided into three main sections, His Pure Heart, His Kindly Heart, and His Radiant Heart; and for those not already acquainted with the main events of His life, there is a brief factual introduction. The book is enhanced by a mixed selection of rare and well-loved photographs, and is itself dedicated to ‘Abdu’1-Bahá. I have read many books by and about Masters from around the world and throughout history. Our home and my room is adorned with photos of many, Jesus included. A photo of ‘Abdul-Bahá is now included, sitting in a place of honour in my meditation area. Yesterday a friend brought roses for Lucia’s yoga class and these fragrant beauties are in a vase beside the photo. ‘Abdul-Bahá loved roses. So do I.
I have been profoundly touched by this man’s words and by the absolute sanctity of his actions. He was a man of the highest character with unbounded generosity and humility. Someone told me once that it was ‘Abdul-Bahá who inspired Kahlil Gibran to write The Prophet. After dipping deeply in this book, I can believe that. Another Baha’I friend said recently that whenever he is caught in a challenging situation at work or at home he asks himself, ‘What would ‘Abdul-Bahá have done in similar circumstances?’ I can understand that now. ‘Abdul-Bahá was a family man of utmost compassion for the poor, to whom he would and did give the clothes off his back. Visitors to his extended household were stunned by the peace, harmony and laughter found there. He was truly an exemplar of what it is like to be fully human. Everyone in our family, teenagers included, has read A Child of Eternity at least once. It is a book that should once and for all erase any judgement anyone feels towards a person dealing with autism or any other physical challenges. There’s a saint inside this autistic girl with Divine messages for all readers. It’s a book which provides an opening for people who are perhaps unsure of trusting the spiritual world. Read it.